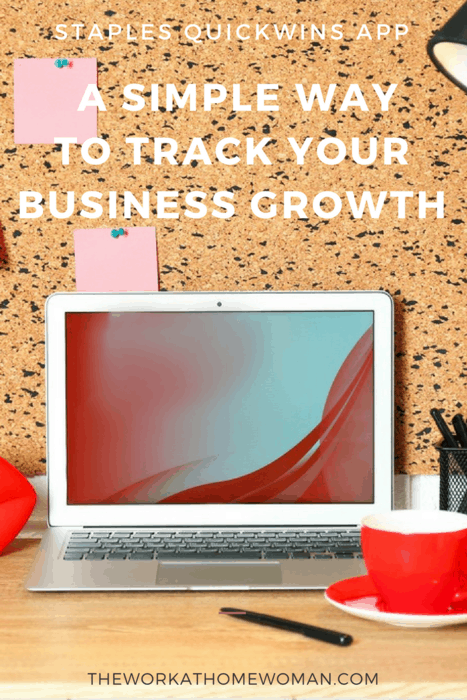 I'm sure you've heard the quote from Peter Drucker that says, “If you can't measure it, you can't improve it.” But according to a survey by Staples, 51 percent of small business owners admit that they do not measure and track business metrics as often as they should. Measuring your marketing efforts is one of the most important things you can do for your business. This information lets you know where your marketing efforts are paying off, and it can save you a lot of time and money. For instance, If you’re paying a social media manager to post updates on Facebook, but you're not tracking and measuring the results — you have no idea whether these updates are working, which means you could be wasting time and money on ineffective marketing methods. So how can you effectively measure your marketing results to see if they're paying off? And what can you do if they're not? Well, I've got some good news! Staples has developed a new platform (which is entirely free) called, QuickWins, which displays all of your stats in one place. Here's how it works and how it can help your small business grow. The Staples QuickWins platform allows business owners to track all of their primary metrics in one convenient place. To create an account you can sign up with your email address, or you can connect your Google account to get started. Once you're logged in, just sync your platforms to track your progress. You can connect Facebook, Twitter, Instagram, Shopify, Google Analytics, and Quickbooks. YouTube, Vimeo, Google Plus, Yelp, Facebook and Google Ads are coming soon. Once your accounts are connected, you can view a general overview of each platform on the main dashboard, or you can click on individual metrics to get a more detailed report. 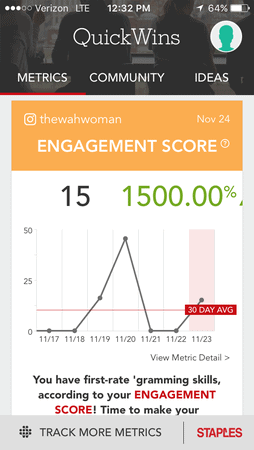 The great thing about the Staples QuickWins platform is it's available on both desktop and mobile devices (Apple and Google Play) — so you can monitor your metrics on the go. Get Real Life Ideas for Big Results. Noticing a dip in traffic, or in social media engagement, but you're not sure how to bring it back up? The Staples QuickWins app offers up real-life solutions to help you reroute. These tips and solutions come from small business experts and influencers and are always being updated, so you never run out of ideas. And these ideas aren't just your run of the mill solutions; they are well-thought ideas and plans that you can test out and see if they work for your audience. If you're working with a virtual assistant or social media manager, this can be a great way for them to execute some new strategies while working in some well-defined parameters. Connect with Other Business Owners. Need a recommendation? Want to know if anyone has had successful with a certain marketing method? Or do you need a place to showcase your expertise? The Staples QuickWins application has a community where you can get answers to your questions, as well as leave responses to other's questions. If you want to see big business growth this year, you need to measure your efforts, and the Staples QuickWins application can help you navigate the way. Find out more about the Staples QuickWins app here. This post was sponsored by Staples. Please be aware that we can only promote advertising from companies that we feel we can legitimately recommend to our readers. I am off to check this app out – it sounds too good to be true! Having all stats in one place would a huge time saver. I was not surprised to hear that many business owners don’t follow through with their analytics. There is such a high volume of info out there that it just becomes overwhelming. Thanks for introducing me to this app. You’re welcome, Neena! 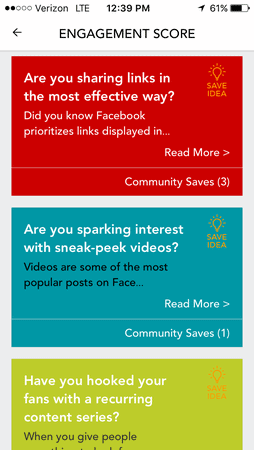 It is a huge time-saver, and I like the suggestions it offers as well. Let me know how it works out for you.